The concert hall in the Jack H. Miller Center for Musical Arts has been designed as an acoustically superior space, but—as might be expected—the attention to detail doesn’t end with the building. 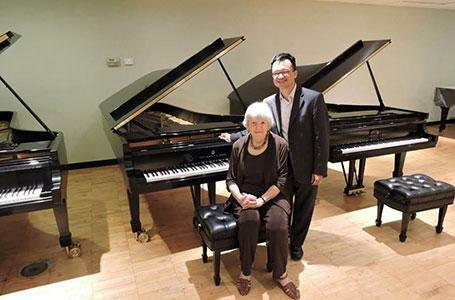 One case in point: when the college received a gift to purchase a Steinway concert grand piano for the hall, faculty member Andrew Le traveled to New York City with retired colleague Joan Conway to select the instrument that would be just right for the 800-seat hall, which will host its first performance during the spring semester. The rest of the building is opening with the start of the new school year this August. The piano has been donated by David P. Roossien of Holland. Roossien previously donated the organ custom-built for the concert hall by Casavant Frères (Casavant Brothers) of Saint-Hyacinthe, Quebec, Canada. That instrument, developed to be ideal for the space, was installed in May. Le, who is one of only 1,600 Steinway Artists worldwide, made the June 30 trip to the Steinway factory and showroom in Queens with Conway, a professor emerita of music and pianist who taught at Hope from 1969 until retiring in 2001, and Mark DeWitt, director of corporate and foundation relations at Hope. In consultation with Conway, he chose Steinway Concert D #599967 for having the ideal blend of clarity, action and expressive dynamic range. For the past 18 years, the college’s primary concert piano has been a Steinway concert grand donated to the college in 1997 by the family of the late Stanley De Pree ’30 of Zeeland, Michigan. It will be relocated from Dimnent Memorial Chapel to the new building’s other concert space, the 125-seat John and Dede Howard Recital Hall. The 64,000-square-foot Jack H. Miller Center for Musical Arts includes not only the two performance venues, but classrooms, practice rooms, faculty studios and office space for the department of music. The building, a major initiative of the college’s “A Greater Hope” comprehensive campaign, is named in honor of Jack H. Miller for his lifetime of generosity to the college. Miller, who resides in Grand Haven and Naples, Florida, and is a 1954 Hope graduate, led the Howard Miller Company for 48 years until retiring in 2002. The John and Dede Howard Recital Hall will begin hosting concerts this fall. The main concert hall will debut with the college’s Showcase Concert (formerly held each spring semester at DeVos Hall in Grand Rapids) on Friday-Saturday, Feb. 5-6. Both the new Steinway and the Casavant Frères organ are sure to be on the program during the two-night February event. A life-long dream of professionally performing music and touring has become reality for Eve Panning ’15, who has been selected to join the prestigious string group Barrage 8. A recent Hope College graduate, Panning double majored in Violin Performance and Instrumental Music Education.